On a day like yesterday, when the markets take an unexpected and brutal bath, it always helps to find a trend-bucker. Fortunately for us, all was not lost because we had included OREX on our watchlist in our premarket report. Even as most other stocks wavered under the intensity of yesterdays bearish push, OREX ran from a daily low of .23 to a high of .39 for a 70% intraday run. It also closed with strength at .34, not too far below the area of a massive gap on the chart. 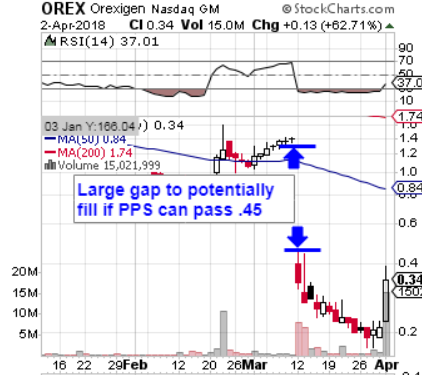 We’ll definitely want to continue monitoring OREX, as even a partial filling of said gap would produce further gains of a significant magnitude. While we’re on the subject of bottom plays, we’re going to add both of the following to our working watchlist, as each one is extraordinarily oversold at the present time. Following today’s session, we will have been tracking MCOA’s movements for exactly one month. When we first began talking about this play in early October it was trading in the subpenny range (.0094), and the results of one heck of a bullish month carried the stock to nearly twenty cents! From our observed low it measures as a one-month overall upswing of 2011% which is one of the largest gainers we’ve bagged all year where stocks are concerned (Our options calls reach percentage gains of more than 1000% fairly routinely). Also continuing its multi-day run yesterday was GLFH, which we brought to the table on Monday morning. It has now officially appeared in every report we’ve published for the entire week, on the strength of yet another solid performance yesterday. We said early on that we’d be looking for GLFH to be a slow and steady riser over these four sessions; it has made gains every day but never exceeding 35%, and yesterday’s move was no exception. What it has done, is maintain those advances and kept piling one on top of the other. It’s rare that stocks see multi-day runs exceeding three days, so at this point, we’ll begin to ready ourselves for a consolidation that could come at any time. Our incredible success with numerous stocks this week dictated that we shy off of the options trading arena for a few days, but it’s high time for us to enter some ideas into the mix this morning. For both of the following plays, we’ll submit a weekly target* (expiring today) as well as one for next week, just in case these stocks put together multi-day increases of their own. *Dabbling in weekly options contracts on a Friday should not be attempted by anyone except expert traders! On the chart below, we’ve pointed out the various reasons for why we like it from a technical perspective. Additionally, we always like to track a wide range retail stocks as the holiday shopping season approaches, and it fits the bill in that regard as well. We’ve got an extended-term options idea for this one, with the LE 12/16 $12.50-17.50 Calls. We had multiple runners come out of yesterday morning’s premarket report, but the star of the show was was without a doubt IFAN. This was a case of looking in the right place at the right time. The stock had posted a marginal increase the session prior, but yesterday’s run was a cut above. We witnessed as it traded in a fantastic range from .0031, cracking through the penny barrier and reaching a high of .0118. That worked out to an intraday rip of 281% which occurred on nearly thrice the monthly average trading volume. In instances such as these, we always keep the stock on our radar in the event that the excellent momentum it’s built up washes over into another session. Prior to yesterday morning’s mention, we had signaled NEWC for observation most recently a week ago today, and the ramp-up we’ve seen between then and yesterday’s solid session has been pretty impressive. After witnessing a low of .01 subsequent to last week’s report, the stock has really taken off this week, yesterday trading up from .0231 to a new high of .0449 (+94%), which from a penny, marks an upswing of 349% in just a few sessions. Speaking of new highs, we’ve been tracking AGTK heavily of late, and it too set a new high mark for us in yesterday’s session, despite already being up so high. As we were mentioning yesterday morning, we caught this play on September 14th, at a low of .003, and the stock never looked back. Yesterday’s decent move carried it from .0285-.036, a 26% intraday push, which is incredibly modest compared to the overall run we’ve been watching. Yesterday’s new peak registered as an increase of 1100% on the dot over our observed low. We brought back a familiar play in PLPL last Thursday, and reminded readers to continue paying attention in yesterday’s premarket report. The stock has responded with with a nice performance in that span. As a result of the confluence of both an attractive technical setup on the chart where it recently came down to 4-month lows, in addition to a well-received quarterly earnings report this morning, we want to tag some PG options for potential daytrades and or intraweek swing trades. We had multiple landmark plays that fit the same description last week, and came away with chances for multibag gains in almost every instance. To attempt to do the same thing this week, we’re going to look to the PG Weekly $85.50-88 Calls, which should see some nice activity if the action unfolds the way it appears it might. We’ll be looking for a gap-and-go setup to facilitate that. The “Green Rush” continues… Aside from the three above-mentioned cannabis plays we want to continue to keep the top traded pot stocks on watch for further gains. The momentum in the sector as a whole, as we’ve cautioned readers, has continued in a big way. TRTC, HEMP, OWCP, PHOT, MCOA, ERBB are among some of the headliners in that regard, but by no means the only marijuana related stocks that are set to explode leading up to and following election day, whereupon recreational consumption will most likely become legal in the state of California. Netflix, Inc. NFLX – We persisted in tracking the NFLX options idea that we formulated on Tuesday for the remainder of the week, and they ended up performing great yet again on Friday. If you recall, our designated targets were the NFLX Weekly $117-120 Calls, and they didn’t have a down day all week. McDonalds Corp. MCD - Our highlighted range of MCD Weekly $113-115 Calls was fresh for Friday’s session, and it bore fruit as well. While we didn’t sweep the range in terms of hefty gains, the $113′s in particular did provide a nice chance to profit on the day. Subsequent to the alert we put out on AGTK last month on the 14th, we would observe an overall low of .003, and the stock has never fallen below that level since. In fact, what began as a subpenny play, has rumbled its way to multiple pennies after a fantastic performance last week. Running to a new high of .0298 on Friday, the stock registered an overall increase of 893% over our observed low, and with a strong close at .028, we’ll be on the lookout for some momentum spillover into this week. The possibility of a dip-and-rip forming on the chart also appears to be a plausible scenario, so we’ll be on our toes watching for that possibility as well. AGTK is also a part of the cannabis sector, which of course we’ve been watching more intently, and plan to continue doing so leading into election day the week after next. This is another familiar play for us, and we want to tag it for closer observation again this morning on the strength of both a fresh PR hitting the wires along with an attractive technical setup on the chart. As you can see below, the stock has recorded a higher low in each of the last five sessions since coming off a bottom, and indicators suggest that things could heat up for this play at any time. We’ll keep an eye peeled. Our NFLX options ideas from Tuesday morning continued to provide us with excellent intraday gains to take advantage of yesterday, despite already logging moves ranging between 54-98%. Our target range, the NFLX Weekly $117-120 Calls, once again put up fantastic performances, regardless of which strike point was chosen. We’ve had a nice two-day run with these contracts and are ready to move on to the next idea, unless we see a dip-and-rip setup on the chart, in which case they would come back into play. Our other options idea from yesterday also worked out in spades. We noticed that the stock had been absolutely abused on immaterial news the session prior, and took the chance to pounce with a signal on the stock for a possible bottom play, and both short and mid-term options ideas. Those were the BANC Weekly $12.50 and $15 Calls and the BANC 11/18 $17.50 and $20 Calls, and with the exception of the $20′s which are still too far out of the money to have seen any appreciable upswing, they all did rather well. With the stock appearing to gear up for another solid session, those 11/18 $20 Calls could join the rest of the group in making moves for us in upcoming sessions, so we’ll continue to keep a close watch. We’ve got another post-earnings options idea to add into the mix this morning as well with American Express, which beat expectations and raised guidance on profits for the remainder of 2016. Accordingly, we’re going to want to track AXP Weekly $64-65.50 Calls. 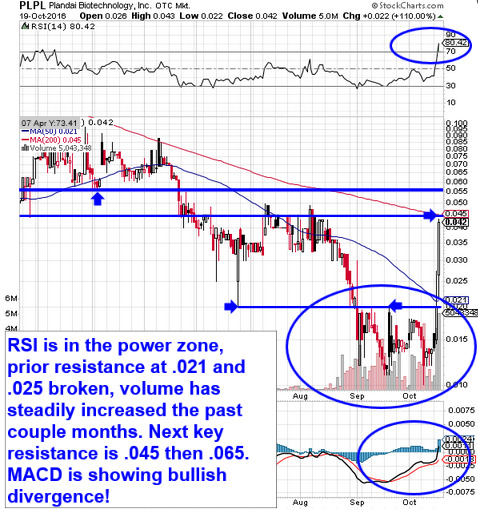 Cannabis Science, Inc. CBIS – CBIS continued to push to new highs after our flag of the stock on Tuesday. After running 44% that day from .034 to .0489, we saw another solid round of gains yesterday. The stock traded in a range from .049 to .077, for a 57% intraday run and an overall increase of 126% over Tuesday’s low. IMD Companies, Inc. ICBU – Also among the marijuana stocks that we’ve slated for observation was this one that was new to our reports yesterday, and put up a pretty good move for our first day of observance. 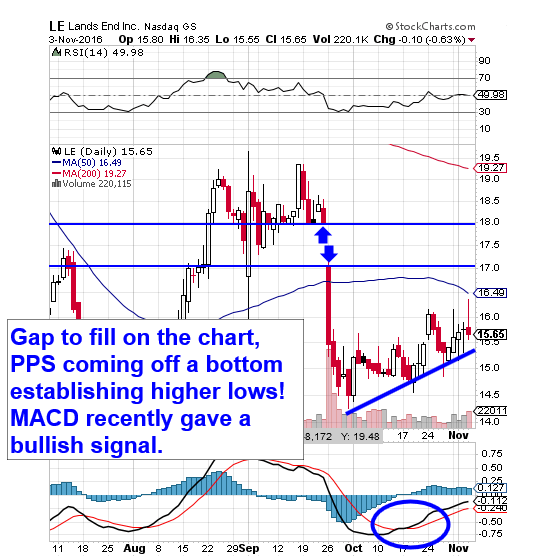 Being added to the watchlist this morning is PLPL, as a momentum play. The stock has been on the move over the past couple of sessions, having cracked through key resistance points on heavy volume. If it can breach the 200DMA of .045, things could get even more interesting from here. 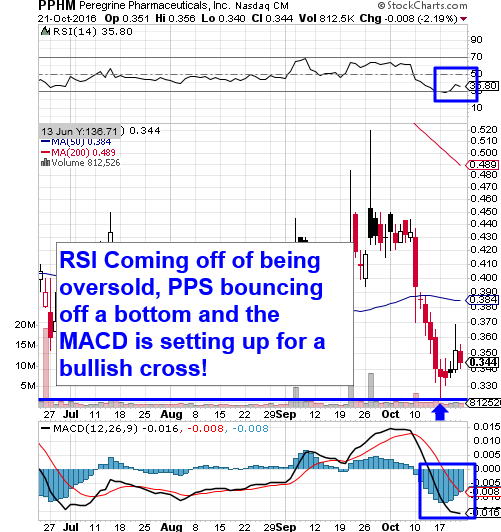 We’ll remain interested in this play provided it can hold support at or above .03 on any pullbacks.